I've been making quiches for years - pretty haphazardly, I must admit. I think I've finally got it right. 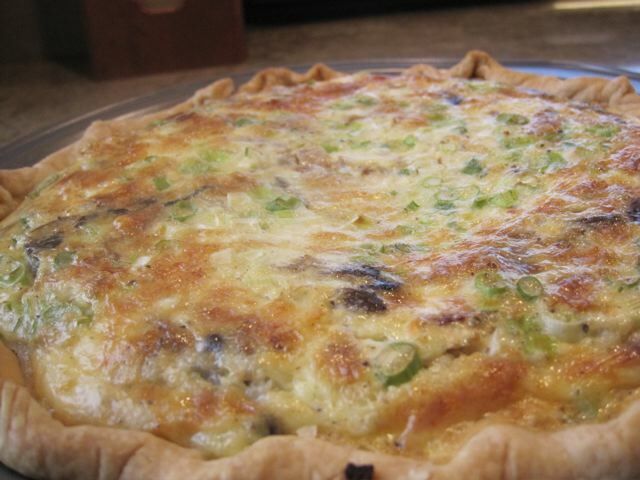 This is a basic recipe and you can make any type quiche that you want from seafood to vegetarian. What makes it "perfected" is the custard recipe - I think I've finally got that egg/milk combination nailed!! Don't leave out the freshly grated nutmeg. It's critical. 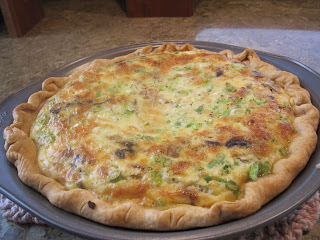 I made this quiche for a brunch potluck here at Palm Creek in Casa Grande, AZ. Not a crumb left!! Saute onion in small amount of bacon grease until translucent. Add mushrooms and sprinkle with salt and pepper. Cook until mushrooms give up their moisture. Combine eggs, half and half, skim milk, nutmeg, scant ¼ tsp. table salt, and generous grinding of pepper. In the prepared 9 inch pie crust, scatter ½ C. cheese, bacon, mushroom/onion mixture, remaining cheese, and the green onion. Pour the milk/egg mixture over all. Cook in a preheated 350 degree oven for 30 - 40 minutes until set. Oven temperatures vary so check to be sure center has set before removing from oven. And just for the record, all of it was eaten at the potluck. Nothing but a clean plate came home with us. I bet the custard would work good in a frittata too? We'll just tell her it's bacon flavored pecans! !